Hundreds of prints from extinct carnivores and herbivores likely to be 100 million years old have been unearthed in northeastern British Columbia, pressed into a surface spanning an area the size of three Canadian football fields, local media reported. Many of the three-toed prints discovered near Williston Lake about 1,500km northeast of Vancouver reportedly resemble the Toronto Raptors logo. "We're looking at a few hundred foot prints that were exposed when I visited the site. If it keeps up that density and we are able to peel back a bit of the surface and expand it by another 1,000 square meters we're likely to find there are thousands of foot prints," paleontologist Rich McCrea told CBC News. According to McCrea, chances are high for the newly discovered dinosaur path to become a world-class scientific and tourism site. He noted that the BC government's approach to protecting and promoting dinosaur zones is archaic, however. The paleontologist is part of a crowdfunding campaign to raise $190,000 to promote the dinosaur track site. "It would be one of the top sites, unquestionably," he said. It already looks like it's going to be one of the biggest sites in Canada. That also means one of the biggest sites in the world." He told CBC News that the area was once a major travel zone for the allosaurus, a genus of large theropod dinosaur that lived about 150 million years ago during the late Jurassic period. According to McCrea, the area is also awash with tracks made by the ankylosaurus, a 9-meter-long, four-legged herbivore weighing up to 6,000kg. 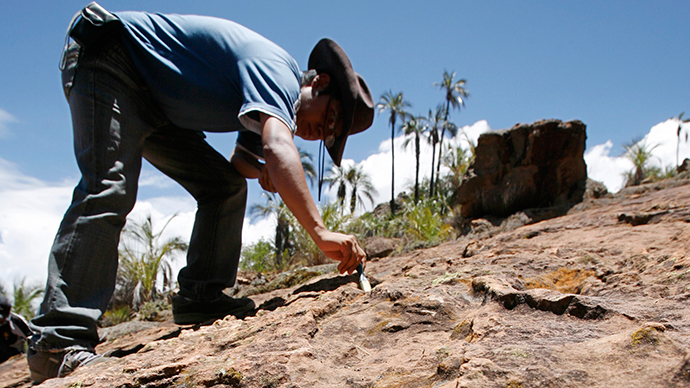 He estimated those tracks are between 115 million and 117 million years old. The challenge is to make the area protected by the BC government. McCrea suggests creating a Peace Country dinosaur tourist zone that rivals Alberta's Royal Tyrrell Museum of Palaeontology, noted for its collection of more than 130,000 fossils. McCrea reportedly wants to see a tourist building overlooking the dinosaur track-way area at Williston Lake. Should his plan come true, the Canadian dinosaur track site could rival China's Zigong Dinosaur Museum, which sits on top of a large concentration of a diverse dinosaur assemblage and claims the largest number of dinosaur fossils in the world, with up to 7 million visitors a year.